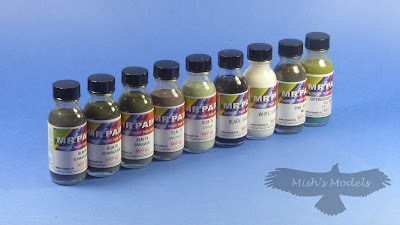 MR.PAINT is a Slovak firm who focus on producing paints for modellers. Their colours allow modellers to use authentic colours and tones and to be assured that they are correct. The paints we have are designed specifically to be used with an airbrush. All paints are pre-thinned for immediate use with a 0.3mm nozzle, however I use them with a 0.2mm nozzle with no problems. The manufacturer suggests that further thinning may be required with smaller diameter nozzles and for this they recommend our own thinning agent, MR.THINNER. However I never found that I needed to thin the paints. I found that MR. PAINT worked best for me at a pressure of 5psi (0.35 bar) using my H & S Evolution using a 0.2mm Needle/Nozzle set. At this pressure I found MR. PAINT to be the most controllable and was I was able to do some very fine modelling on my 1:32 Revell Bf 109G-10. Am I sold on this new paint? You bet I am, if there is any disadvantage it is the smell and the need to use in a well ventilated room, on account of it being a lacquer based acrylic paint. What I love is the ease of use, ease of cleaning the airbrush. The paint sprays like Alclad and has the covering and translucent qualities of Mr Hobby Gunze Aqueous. I highly recommend this paint for the dedicated modeller. I am indebted to and wish to thank Mr James Hatch of Large Scale Modeller for his help in securing these paints for trial and review.